I have been working so much and getting ready to get married that I haven't had the time to get on here. My 325i has been sitting since my last post a couple of months ago. I finally have the money I need to get a replacement engine. Now I just have to find one. I was thinking of upgrading to the 3.0L engine. I can't find any DIY's on this subject, just lot's of posts of people on other forums arguing about it. If I get a 3.0L engine to drop in, what other parts would I need to make it work in my 2001 325i Sport 5sp manual? Don't know. Just wanted to say welcome back. GL on your project. I've seen a couple decently priced s54 motors on M3Forum and E46F.........unless you've already got the 3.0L motor. 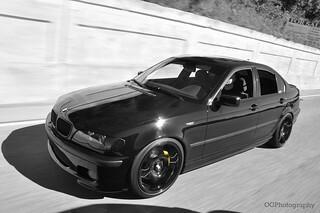 I want to say theres a guy on here thats switching his auto ZHP to a manual, can't remember where i read that at. If you can dig that up, that may help with the drivetrain end of things. G/L with the project, sounds like it could be fun/leave room for some modding prior to motor install. Not totally sure on the entire parts list, but wiring loom should be compatible. If going to a 3.0L, remember you will need a complete motor with intake manifold including MAF, and I also believe headers, since they are different from the 2.5L. Also probably need computer for a 3.0L or yours burned. Glad to see you back around here... what're your thoughts on an s54? Mine is already a Manual, and no I do not already have an engine. What's a decent price for an S54? I'm looking to stay around 100K miles or less on the engine. Lol, beats me. A little ebaying points to ~$4500. Found this in Illinois on Car-Part.com. It's 172 miles away so I could drive to pick it up instead of having it shipped. Anyone know anything about this site? Car-Part is legit. It's a nationwide scrapyard inventory. The yard itself is what you need to look into.